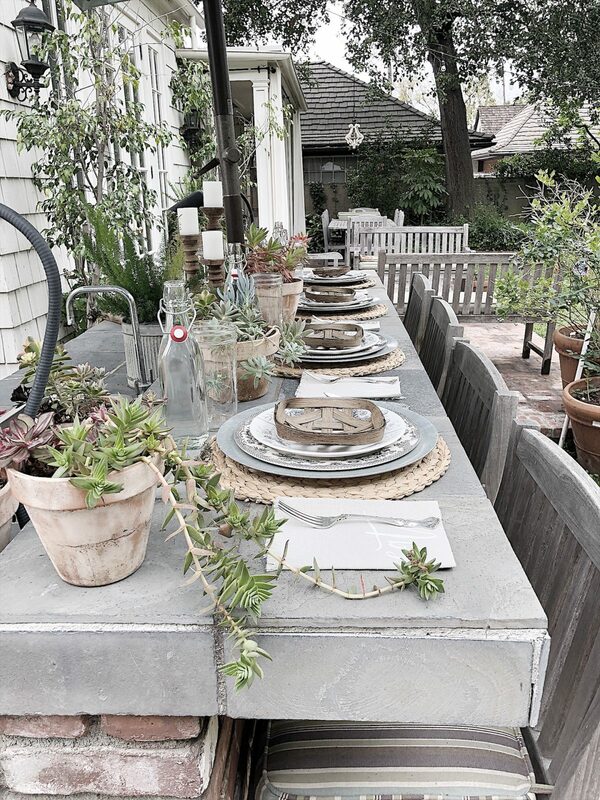 The theme for my blog this month is outdoor entertaining. 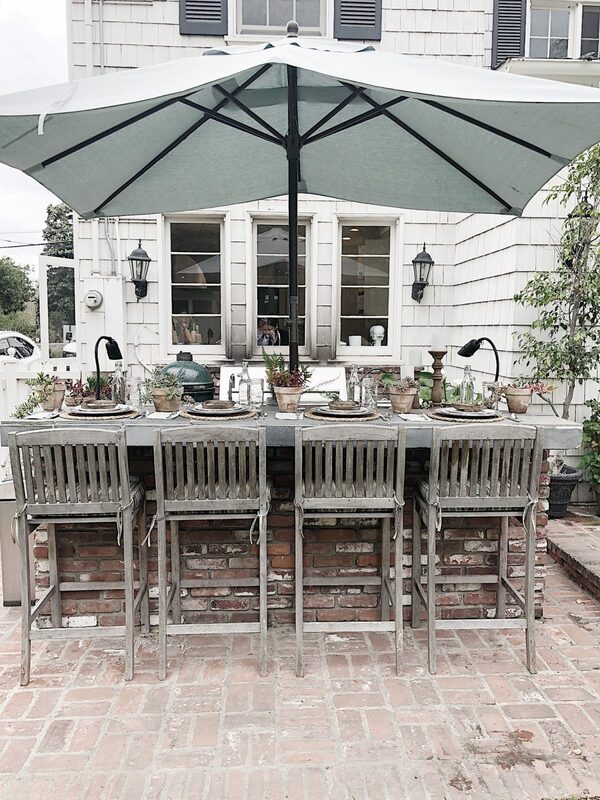 With summer just around the corner, it is the perfect time to get everything ready outside for entertaining. Most of you know how much I love to cook. (Although I should admit that I like to entertain more than just cook.) 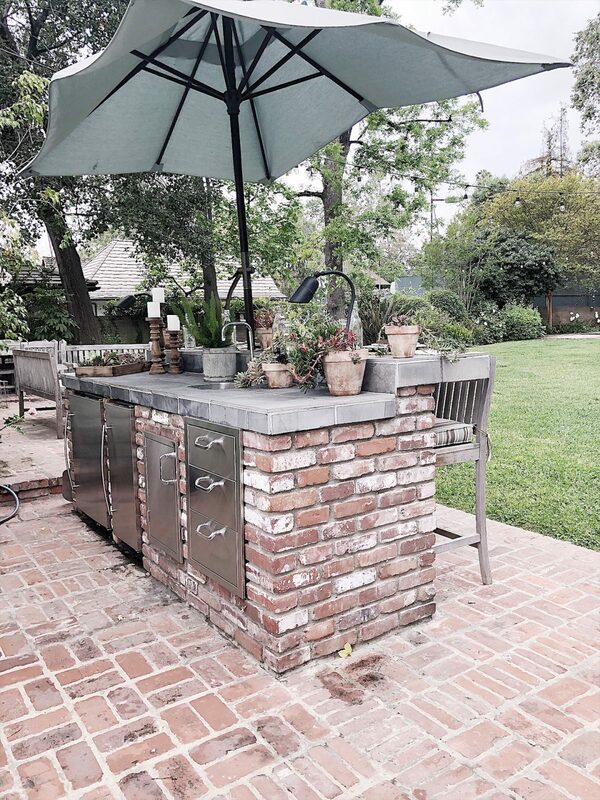 About ten years ago I talked my husband into adding an outdoor kitchen to our backyard. 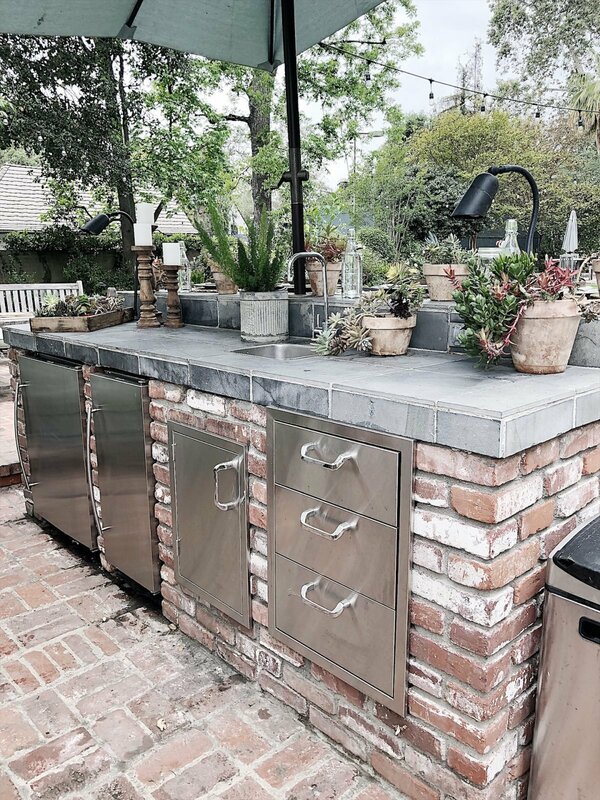 We already had the barbecue and smoker so adding the outdoor kitchen really meant we were adding the island with the counter and a few kitchen items. It’s one of my favorite “rooms” in our home. We added this island and what a difference! The island has two different counter heights. One for seating (or without the chairs, it makes a perfect bar height) and one counter for prep. I also added storage space, an ice maker, and a refrigerator. Usually, it doesn’t have so many plants but I couldn’t resist when I styled it today! 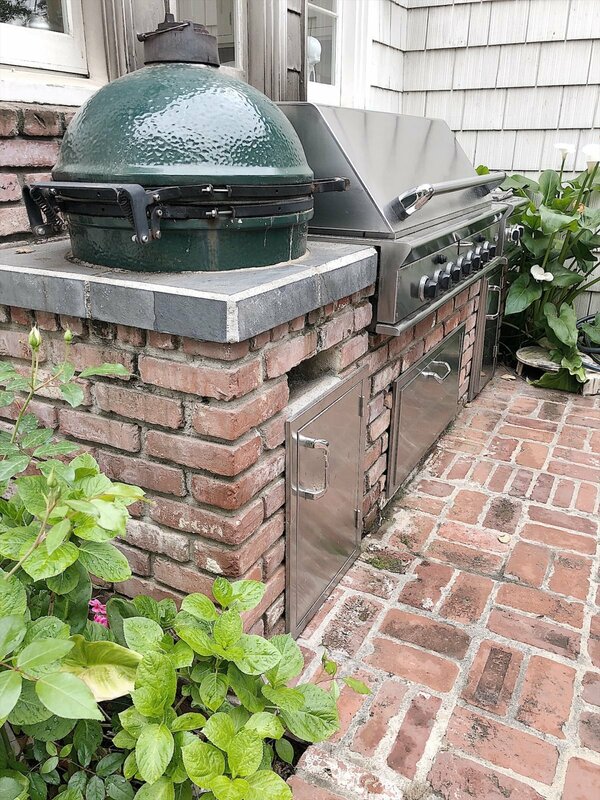 This is the side that already existed with our green egg and 48″ DCS grill. I just had the inside of the grill redone because a lot of the parts had kind of deteriorated in the last ten years. It looks almost brand new now! I did add the two burners on the side of the BBQ when we build the kitchen island. I don’t think I really needed these but it seemed like a good thing to do at the time. It is nice to have the burners to saute veggies but often I end up grilling almost everything for the meal! All of the brick is original to our house from a hundred years ago. 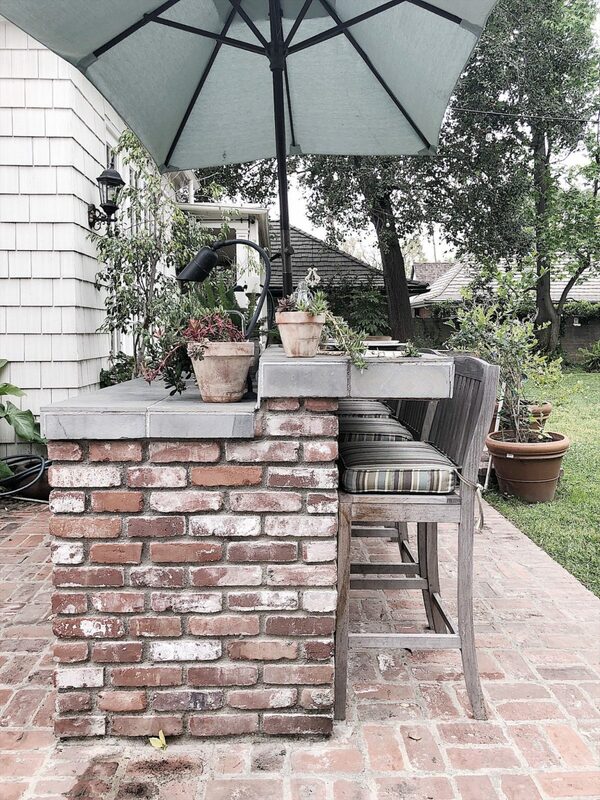 We found a brick chimney in the middle of our home when we re remodeled in 2000 and we used the brick for our outdoor fireplace and patio. We had some leftover and I am so happy we kept it so we could use it for our outdoor kitchen addition. The counter seats for perfectly. I often serve appetizers here to attract family members and dinner guests to relax and entertain me while I am cooking. Of course, if I can set a table anywhere you know I will! 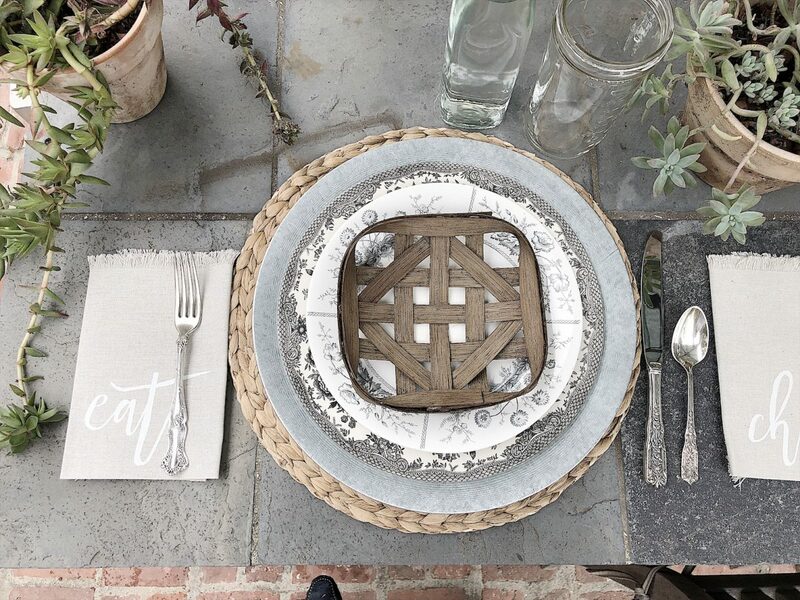 The rattan placemats are from IKEA, the galvanized chargers are from Hobby Lobby and the napkins are from @kitchstudios. 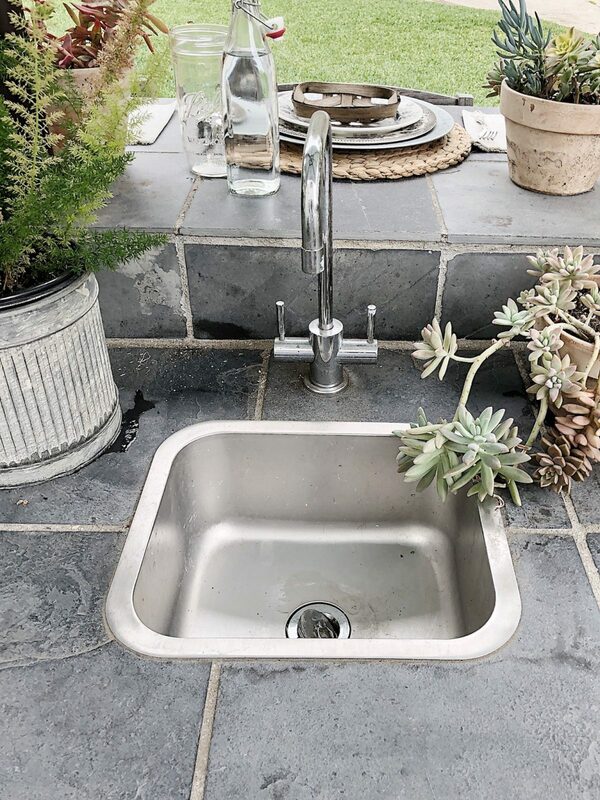 If you are thinking about putting in an outdoor kitchen, a prep sink is a must. It’s small but works perfectly. Our island is 9′ long and the back barbecue island is 8′ long. The eating counter is 20″ wide and the prep counter is 24″ wide. 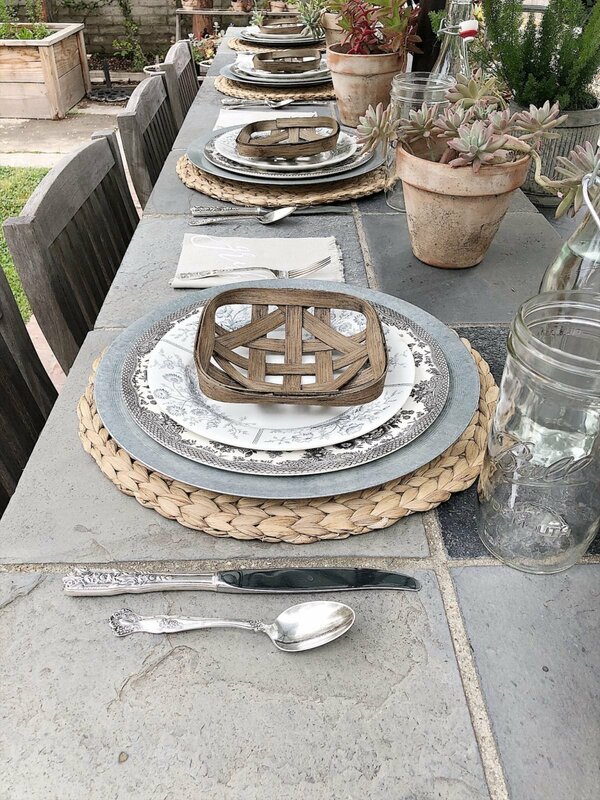 I love styling the outdoor kitchen island with items from inside our home. 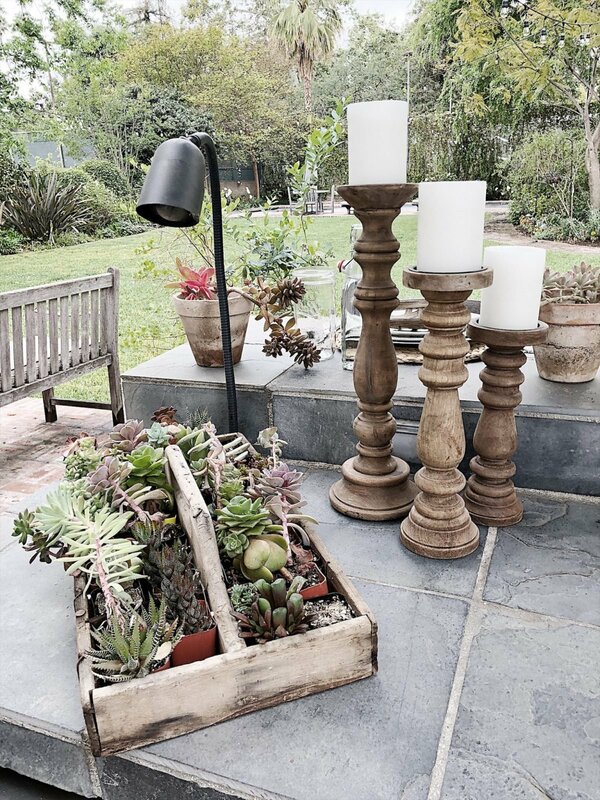 Why not bring the indoors outside when you entertain? 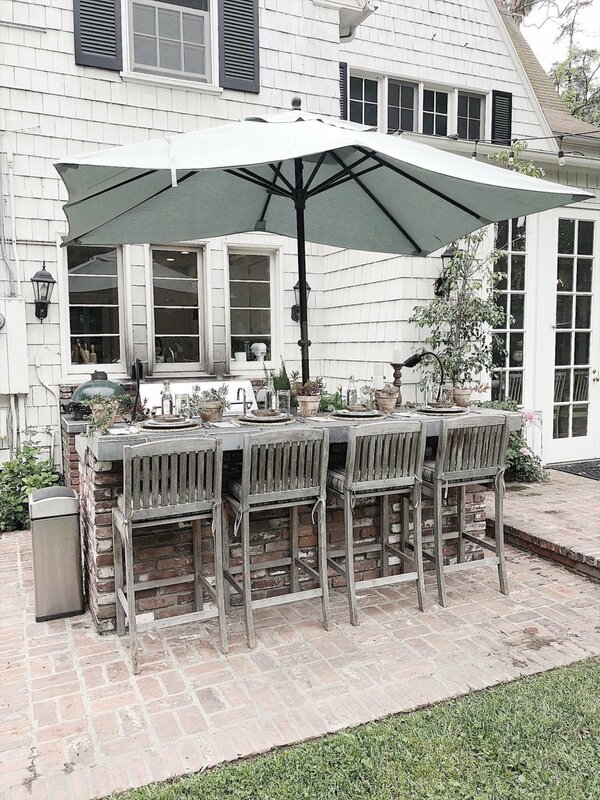 I am going to call up some friends and have a little dinner party outside as the weather is really warming up this weekend. 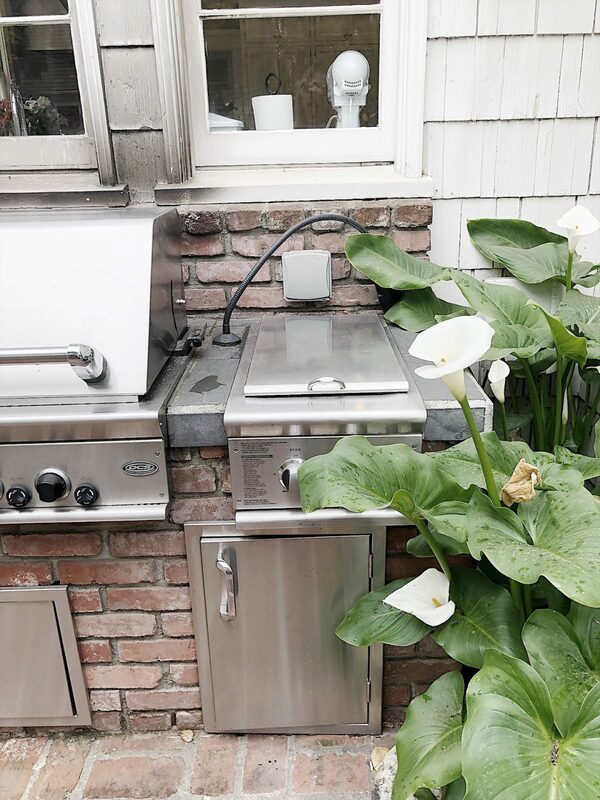 I would love to know what you think of our outdoor kitchen. It is very well used and I am so happy with the look and style of it. Come join me sometime for a fun California barbecue dinner! And if you have any great barbecue recipes, please share them with me! I love it!!! You’ve thought of everything, even a pretty trash can. Are those mini tobacco baskets from Hobby Lobby? I bought a larger white one to hang on a wall recently but didn’t see this size. Great touch, as always ???? I absolutely LOVE your outdoor living space!!! It’s so inviting and screams come relax and have some fun!!!!! I love your hospitality!!!!! ???? Fabulous Leslie! The brick is so pretty with the grey counters. Enjoy!! This is brilliant. It seems that you have thought of everything……..even a permanent hole for the umbrella. Love it!!! Where are the mini tobacco baskets from?! Did you ever find out where the mini tobacco baskets came from? Looks like a dream come true! 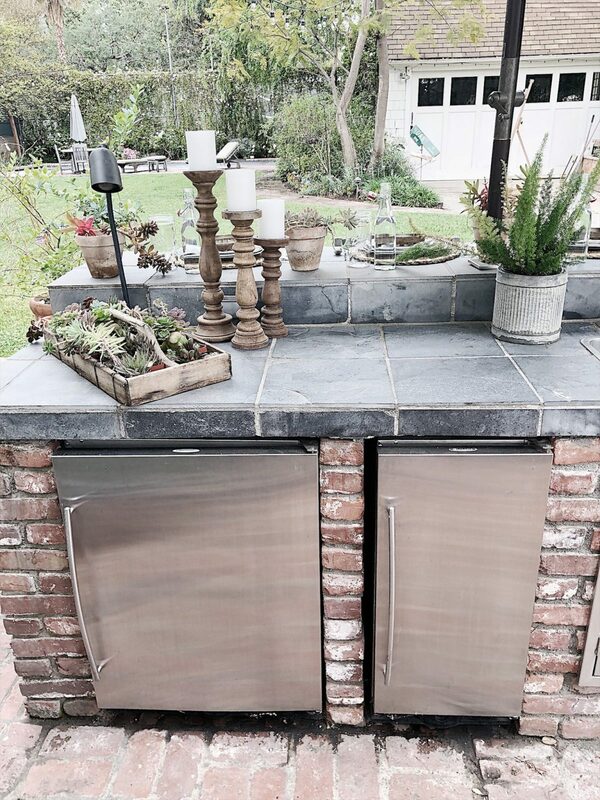 How about some stories with you cooking up a little something in your outdoor kitchen? Wow!!! You think of every possible detail…I absolutely love it. Makes me want to get in to gear with getting our backyard done now. I too have to ask where you got your miniature tobacco baskets?!?!? Your style and warmth of personality are so evident in your approach to entertaining, that’s the very first ingredient in a welcomed come sit a while ???? there’s a big difference in entertaining and serving a guest a dinner with hospitality. You have accomplished that with the relaxed atmosphere and approach to your home and to your guest . Thanks for sharing.